In 2017, shortly before her death, Ruth Keeler Longacre donated a photo album and other papers that belonged to her mother, Florence Moyer Keeler (1898-1992) of Towamencin Township. Florence’s husband Henry died in a farming accident many years ago in 1946, and Florence never remarried, continuing to live at her husband’s family home on Keeler Road with her four unmarried children, Paul, William, Ruth and Laverne. Son Curtis Keeler, who was married to Verna Long, lived in Telford. They were the parents of local news reporter Bob Keeler. The album is well-labeled and paints a warm picture of Florence’s life from teenage to senior years. She was a kind and capable woman who cared for three sons with developmental challenges after the sudden and tragic loss of her husband. The collection also includes photos taken by Ruth and Laverne Keeler in their adult life and work. Ruth married at age 56 to widower Paul A. Longacre and became a well-loved stepmother to his children and grandchildren. The family who lived together at the old Keeler farm, circa 1950. 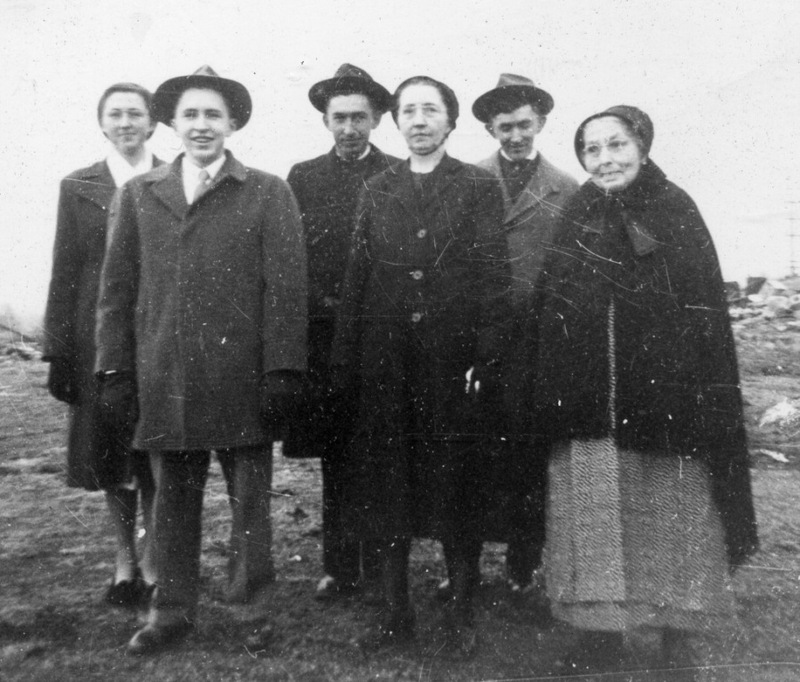 Left to right: Ruth, Laverne, Paul, Florence, William, and Florence’s mother-in-law, Mary Conver Keeler (1867-1956), all members of Towamencin Mennonite Church. Florence Moyer, circa 1918. She was a daughter of William & Esther Clemens Moyer, members of the Plains Mennonite congregation. An early and fun photo in the album is of “Mrs. Clarence Ziegler” giving her daughter a bath, ca. 1920. Two other charming photos — interesting because they depict early Mennonite youth activities — are especially interesting to the Mennonite Heritage Center because they show our longtime friendly volunteer, Curt Stoudt, in his youth. 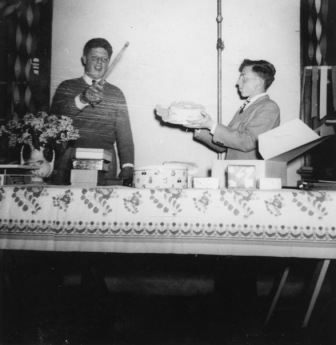 In the first picture Curt assists “auctioneer” Lester Halteman with a cake for sale at a youth project auction at Towamencin Mennonite Church, ca. 1945. 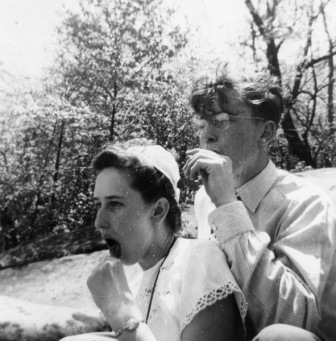 The second photo shows Curt and girlfriend Sue Keeler (niece of Henry & Florence Keeler) doing something — perhaps enjoying lollipops? — after a hike up Haycock Mountain, a popular destination for church youth groups in years past. 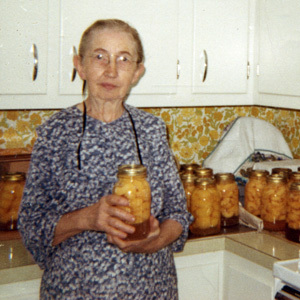 This snapshot of Florence with beautiful jars of canned peaches is another of my favorites. 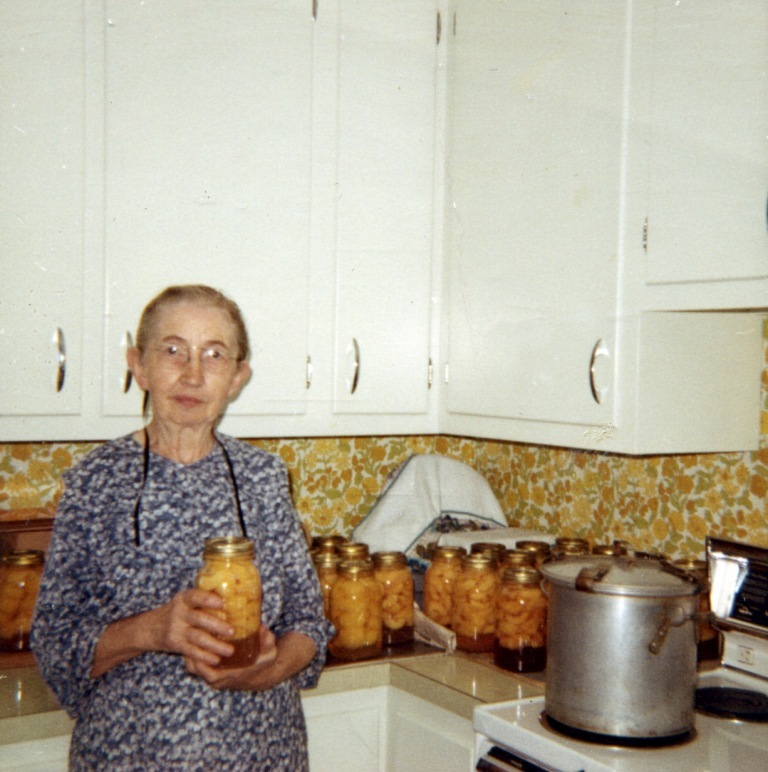 Canning was a regular part of life for farm families, but rarely memorialized in photos. Another photo of a regular event that was rarely photographed — teachers prayer meeting at Penn View Christian School, circa 1970. Ruth Keeler taught there at the time and is not in the photo, as she was behind the camera. Can anyone identify the other women? 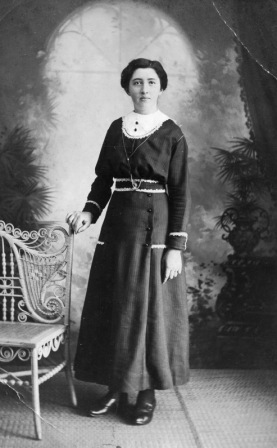 The combination of head coverings and fashionable attire was a feature of local Mennonite life in these years just after Franconia Conference dropped its expectation of uniform dress. Another set of photos in this collection with importance for local Mennonites are of Bethel Community Mennonite Church, Norristown, a mission specifically for African-Americans. Laverne Keeler took the photos and labeled them. I believe he was a “worker” at the mission. The building used by Bethel Church in the 1960s was crude — an old garage with a second floor. The first two photos show interior and exterior of the mission building in 1963, with Laverne Keeler and John Hart seated inside the sanctuary. 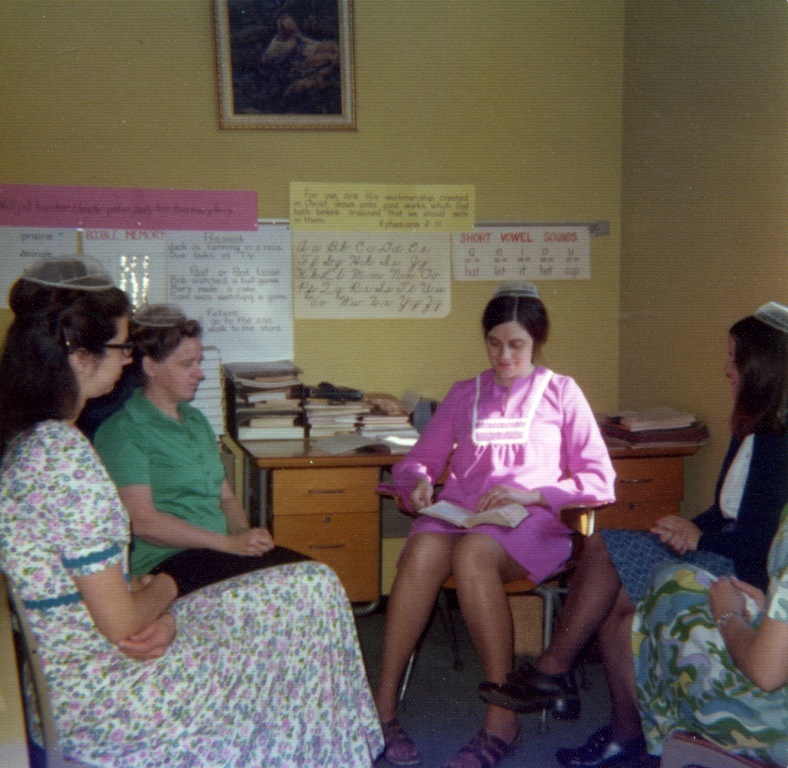 A third photo shows the interior in color in 1968, with a Summer Bible School class using the space. The final two photos show a “new” home purchased for the church in April 1969 — another run-down old building that Bethel would renovate shortly. Though the facilities were not ideal, the mission was vibrant. Bethel Church in 1990 merged with the First Mennonite Church of Norristown and Fuente de Salvacion congregation to form the multi-ethnic and bi-lingual Nueva Vida Norristown New Life Mennonite Church, which recently celebrated 100 years of Mennonite ministry in Norristown. For more on this story, read A Mennonite Church in Norristown by Beverly Benner Miller (2015), available for purchase at the Mennonite Heritage Center. I think the flowered dress woman is Miss Brenda Derstine. Woman in flowered dress is definitely Brenda Derstine, first cousin, once removed of Ruth Keeler.